Our family doesn’t really have a monthly budget that we stick to. We want to enjoy life and don’t want to be held back from doing the things we love by adhering to a strict budget. And while enjoying life doesn’t always cost money … a lot of times it does. But at the same time … we also want to save as much money as we can … so we can use it to generate more income. So … instead of following a monthly budget, we try and only buy the things we want to afford. Those things that are worth it to us … like healthy foods, a mortgage, and even a car payment. We just end up choosing to spend money on those things that we want to afford. And things that are not important, we choose not to afford those. 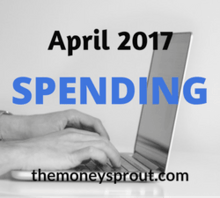 Where Did We Spend Our Money in April (2017)? Here is a high level breakdown of where we spent our money in April. We also keep a more detailed breakdown of these categories … but we will keep it all high level here. This category will always fall towards the top of our monthly expenses. We have a 30-year fixed rate mortgage that will always be a monthly expense … until we pay it off or sell our home. Besides our normal mortgage payment, we did have some extra home maintenance expenses last month that were out of the ordinary. Plus we had to spend over $100 on chemical supplies for our pool. Yes, we have a pool and it can be a money pit. Finally, we had a problem with our refrigerator that needed serviced. I try and do a lot of these types of fixes around the home … but this one was out of my expertise! Finally! We have been struggling to get our savings up towards the top of our spending. Our goal is to save a minimum of 20% of our income … but that is going to take a bunch of sacrifice to hit that target. This past month we came in above 15%, which is good after falling short of 10% in March. The category is called “savings” but in reality it could be considered “investing”. We have a goal to bump our annual dividend income earnings up to $3,000 by 2018. In order to reach that goal, we need to invest new money into the stock market each month. Guess where those new investment dollars come from? Yep … our savings. Note – Our dividend income for 2017 will be approximately $2,400. We don’t like to let our money sit idle in a savings account earning very little in interest. Instead, we would rather earn 3% or more yield by investing in quality dividend stocks. The higher our savings rate … the more future income we will earn. I actually don’t mind our food costs being high. Actually, I would rather it be higher than our housing and transportation expenses. Our family believes that the most important investment you can make is in your health. What is the point of working hard to invest and build sustainable income streams if you are not around to enjoy it one day? So whenever our food expenses are high … we are fine with it as we know it is a solid investment that will pay long term “dividends”. Our utility costs were slightly down in April compared to March and February. While several of these costs fluctuate a little from month to month… most of the time the overall utility spending remains static. A warmer than usual April resulted in less money spent on heating our home … which is great. Our electric and water bills remained fairly constant compared to the previous couple of months. The “Other” category is basically a catch-all for remaining monthly expenses. It covers any kind of gifts or clothing we may buy … which usually isn’t a bunch. Spending for our “other” category was down from March. We didn’t have as many school or sports related expenses for the kids. The bad news … I am still not earning much income from my online business ventures like this blog. The good news … I was able to finally save some money on our hosting plans for the couple of websites that we run. This should help keep business expenses to a minimum. One day I plan to move these expenses out of personal finances into business related expenses. This past month we had a doctors visit and also are paying for some supplements to go along with that healthy food. Hopefully we can get serious here in May and through the remainder of this year. Do you track your monthly spending? How was your April spending?